Logo.3 ... used to build the wall of each water chamber without any vertical joints. Paschal, which commands a strong presence in the Gulf, reveals an unusual project in Germany where its systems were put to good use. Paschal systems, which have been used in the construction of water tanks in a number of GCC countries, were recently used to build unique diamond-shaped elevated water tanks in one ‘cast” that blend into the countryside at a small town in Germany. High specifications were set to meet the hygienic and aesthetic requirements of the project. This meant that all concrete surfaces were required to be executed in exposed concrete quality. Also, the two water reservoirs were to have only two concrete sectional joints each. 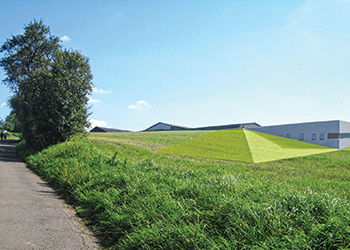 The structure’s shape draws inspiration from its surrounds: the gable peaks of adjacent buildings – which are visible from the foot of its slope – are reflected in the diamond-shaped facade that will be the only visible part of the building after the underground reservoir is covered with earth. Only contours of the overall structure will be perceptible. The original elevated water tank built in 1930 will be taken out of commission once the structure is built. The project showed the excellent compatibility of TTK, Logo.3 and Gass for quick casting of structures. Designed by CP Beratende Ingenieure and the architecture firm Molter Linnemann Architekten for the Stadtwerke Zweibrücken, the new tanks will ensure drinking water supplies for the southern zone of Zweibrücken over the next few decades. The structure has been designed with extensive glazing so that visitors can tour the facility and see the inner workings of the supply buildings. Wolf and Sofsky was supported by Paschal for formwork design as well as Paschal retailer HSB Handels right from the outset. In order to meet the architectural and structural engineering requirements as well as regulations of the DVGW (the German Technical and Scientific Association for Gas and Water) for storing drinking water, the contractor combined Paschal’s TTK, Logo3, Paschal Deck and Gass shoring system in order to build the entire structure with system formwork components. Paschal supplied 580 sq m of Logo.3, 180 sq m of TTK, 280 sq m of Paschal Deck and 314 sq m of Gass formwork and shoring systems for the project. “To comply with the strict hygiene requirements laid down by the DVGW, we had to submit comprehensive material samples and demonstrate organisational and personnel qualifications,” a spokesman explains. 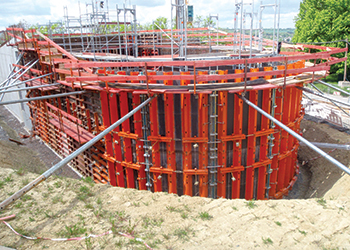 He continues: “Because of DVGW regulations, an absolutely closed-faced exposed concrete surface was specified for the concrete structures for the insides of the tanks, which, without further coating, comply with the requirements of the DVGW. ‘Park option’ for the clamp on the TTK frame ... eases the construction process. Therefore, all wall formwork for the inside walls – combined from Logo.3 and TTK – were coated on site with Zemdrain. The high-quality result is further evidence of the functional and cost-effective combination of the frame formwork by Paschal combined with Zemdrain. Since the two water basins are mirror images, the formwork segments were combined so they could be used twice, and a carefully planned “allocation” of the formwork on site enabled their dual use. Detail adjustments required during the construction phases were resolved by a team comprising Wolf and Sofsky managing director Daniel Brill, construction manager Elmar Anna, Carsten Rupp of HSB Handels, and Paschal consultant Johannes Werth. All parties involved in construction were completely satisfied with the progress in terms of quality, time and construction costs, says the spokesman. For the two water reservoirs, it was specified that there should be only two concrete sectional joints each: the reinforced concrete floor slab to the vertical enclosure walls; and reinforced concrete roof slab to the vertical enclosures. Other special features were the floor slabs (each with a 5.75 per cent incline), the sloping wall of 6 to 8 m, the semi-circular basin with a radius of 4.75 m, the vertical partitions as a demarcation to the central technical room with integrated pressure water doors and the window openings above the water level as well as the two rounded shapes of the 90-degree corners and the two wall displacements to the arrow-shaped continuation of the concrete outer walls. “The corner joints – the partition wall to the technical room with the transition to the outer wall of the drinking water reservoir – had to be designed with a 90-degree exterior corner and a round interior one. This was no problem for the Paschal systems,” says the Paschal spokesman. In harmony ... a perspective of the supply building in the countryside, which is complemented by its green roof. Once the 560 sq m, 60-cm-thick floor slab was cast with formwork panels composed of Logo.3 and the specified surface inclination was concreted and hardened, the entire wall formwork of one water reservoir was assembled. For this, the formwork systems Logo.3 and TTK were combined. Subsequently, the individual formwork units for the inside walls of the tank were coated with Zemdrain. Wedge-shaped timber fillers were mounted on the slightly inclined floor slab as the first “formwork unit”. The basis for the production was the formwork planning by Paschal and the implementation planning of Wolf and Sofsky. The wall-high formwork segments were placed on these timber fillers and fixed on the lower frame of the formwork. 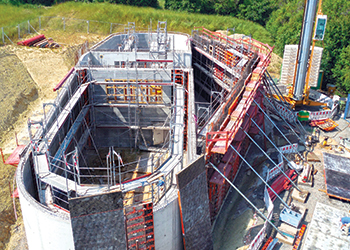 On the sloping floor slab, the TTK – the trapezoidal girder formwork with a clamp connection – was once again able to prove what it can do. 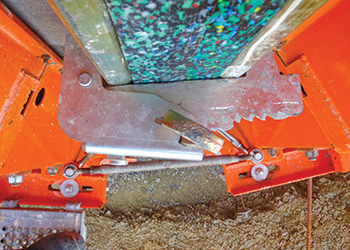 Using the clamp technique, unlimited flexible element offset was possible and the solid connection of the elements with and without filler done quickly and securely, the spokesman says. The integrated parking positions for the connecting clamps provided for an orderly construction process, for example when moving the formwork units. The project also demonstrated how quickly and easily entire formwork units can implemented: “Since all the diagonally symmetrical across-the-longitudinal-axis formwork units for the water basins were used again, the combined formwork units fitted together perfectly and the connection elements, the clamps, were always at hand thanks to the parking positions,” the spokesman adds.